Find hotel near Galeria De Arta Transilva .. 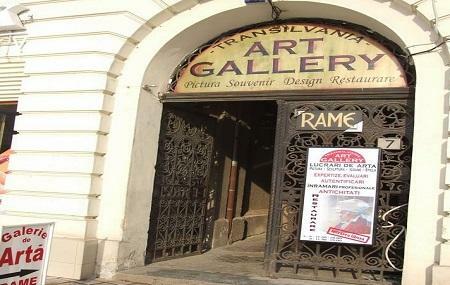 If you are an art connoisseur, the Galeria de Arta Transilvania may just become your new haunt. The place is known for anything related to art- be it a collection of fine art pieces, paintings or even framing and restoration work. You can find modern art pieces here along with authentic Romanian décor items, sculptures, drawings and paintings. The place showcases local artists and gives you a good platform to buy unique pieces that can add to your collection back home. The ceramic work is another highlight of the place. If you are on a budget, explore the souvenirs and small gift items at the gallery and if you don’t mind the price, you might just find a masterpiece here amidst the crowded collection. Unfortunately i visited during a snowstorm so i couldn't do much but i give you that' Brasov is not very good place to go at winter (very big to walk around during cold days and misty). Also food is not so great but be sure to give a chance to local goulash soup cuz it's delicious!